Rev. LoraKim Joyner is a Unitarian Universalist minister, having served in parish ministry for 10 years in North Carolina, Minnesota, Texas, and Florida. Currently she serves as a community minister in Multispecies Ministry and Compassionate Communication, affiliated with the Community Unitarian Universalist Congregation at White Plains. She is also an adjunct professor at Meadville Lombard Theological School where she teaches Compassionate Communication and Multispecies Ministry. 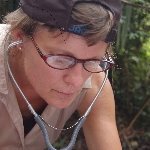 She draws on her training as a Certified Trainer in Nonviolent Communication and over 30 years as a conservationist and wildlife veterinarian to lead One Earth Conservation . With her team, they support others through their international Nurture Nature Program, based largely on the foundations of Nonviolent Communication, that seeks to empower the people saving the planet. She travels to areas in Latin America to stand in solidarity and witness to the plight of the parrots there, and do what she can. One Earth's projects extend to Guatemala, Honduras, Nicaragua, Paraguay, and Guyana. Developing interpersonal relationship skills in congregations is integral to working with the conflicts that arise. These skills can be applied to any spiritual community. LoraKim explores what gets in the way of seeing the inherent worth and dignity of others when there is conflict in congregations. The strategies LoraKim offers can be applied to any spiritual community. LoraKim addresses the sense of overwhelm that can accompany holding the needs of the many. Practicing self empathy is a pathway to living in the tension of mutually holding my needs and the needs of others.